Burnley fans left Old Trafford on Tuesday night in something of a bitter-sweet mood after Sean Dyche’s side let two points slip through their grasp with Victor Lindelof’s injury time equaliser. Normally, leaving with just a point after being 2-0 up with just three minutes of normal time remaining, would be cause for deep frustration, especially when points are so precious for a team involved in the fight against relegation. But sometimes, there is a need to step back and look at the bigger picture. Especially when you are a Burnley fan. That was the third season in a row that Burnley have taken on Manchester United in front of over 74,000 and left unbeaten. Jose Mourinho couldn’t beat the Clarets on his own patch and neither could Ole Gunnar Solskjaer, who had won eight in a row before coming up against Dyche’s side. It was the second year in a row that Burnley have stunned Old Trafford, taking a 2-0 lead, forcing one of the most expensive teams in the world to scramble for a point. I don’t have much tolerance for the ‘Little Burnley’ mentality that says we should simply be grateful for even having a club after the Orient game or that responds to every setback with a reminder that Tuesday night’s were once spent in front of meagre crowds at Hartlepool and Darlington. But those of us who grew up watching season after season of mediocrity in the fourth division, and even for those younger supporters that later saw us struggle to get even close to breaking out of the Championship, the idea that Burnley would go three years unbeaten at Old Trafford would have been the stuff of fantasy. United lived in a different football universe to Burnley and the only time we were ever likely to cross paths would be if the Cup draws willed it – then it would be a ‘day out’ or a ‘pay day’. Not since the early 1970’s have Burnley been in a position to compete in this way with United and I would argue that Tuesday’s performance was in many ways the most impressive of the lot. That 0-0 draw in October, 2016, came thanks to an incredible goalkeeping performance from Tom Heaton in a total rearguard display - it was a back the walls, against the odds battle. Last season’s draw came in the midst of a series of impressive away results and performances against the top clubs and such was the Clarets form that the result hardly felt like a shock. But this was a performance of such confidence and maturity that it was hard to remember it was only a month ago that Burnley collapsed to a 5-1 defeat to Everton and looked utterly lacking in belief and their once characteristic organisation and discipline. 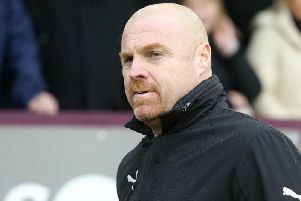 The Clarets are still in the fight against the drop, but they played against an in-form United with the same approach as last season when their belief was sky-rocketing. Heaton was magnificent in goal and Tarkowski and Mee in front of him, once again made all those challenges and blocks and seemed to always be in the right place at the right time. Cork and Westwood grafted, tackled and then used the ball intelligently. Jeff Hendrick, who for so long this season looked utterly lost in his ‘number 10’ role, turned in another accomplished display on the right of midfield. Up-front Ashley Barnes was at his battling best and Chris Wood looked like a goal-threat again – both were to get on the scoresheet. This was no lowly Little Burnley scrapping against the odds, this looked like a mid-table team with some swagger, taking the game to Manchester United. Saturday against fellow strugglers Southampton is a vital episode in the battle for Premier League survival but after Tuesday’s effort at the ‘Theatre of Dreams’ it is worth taking a pause to remember just how far this club has come.